To add a new data source, you must create a parser that transforms the data source data into JSON messages suitable for downstream enrichment and indexing by HCP. Although HCP supports both Java and general-purpose parsers, you can learn the general process of creating parsers by viewing an example using the general-purpose parser Grok. The file you want is typically the access.log, but your data source might use a different name. Create a Grok statement file that defines the Grok expression for the log type you identified in Step 1. You must include timestamp in the Grok expression to ensure that the system uses the event time rather than the system time. Refer to the Grok documentation for additional details. From the Ambari Dashboard, click Metron. In the NAME field, enter the name of the new sensor. In the Kafka Type field, enter the name of the new sensor. 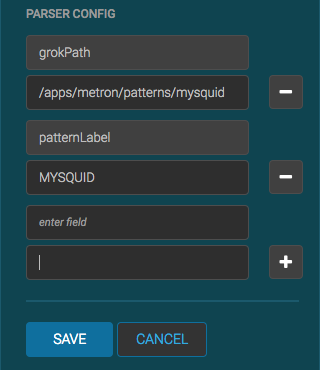 In the Parser Type field, choose the type of parser for the new sensor (in this example task, Grok). Don't worry if you see "No Matching Kafka Topic." The Kafka topic will be created automatically when you save. For SAMPLE, enter a sample log entry for the data source. For STATEMENT, enter the Grok statement you created for the data source. The Management UI automatically completes partial words in your Grok statement as you enter them. You must include timestamp to ensure that the system uses the event time rather than the system time. If the validator finds an error, it displays the error information; otherwise, the valid mapping displays in the PREVIEW field. Consider repeating substeps a through c to ensure that your Grok statement is valid for all sensor logs. Click SAVE to save the sensor information and add it to the list of sensors. Click the pencil icon to edit the sensor you just added. Scroll down to the Parser Config section. In the first open field, indicated by enter field, enter timestampField. In next open field, enter timestamp. 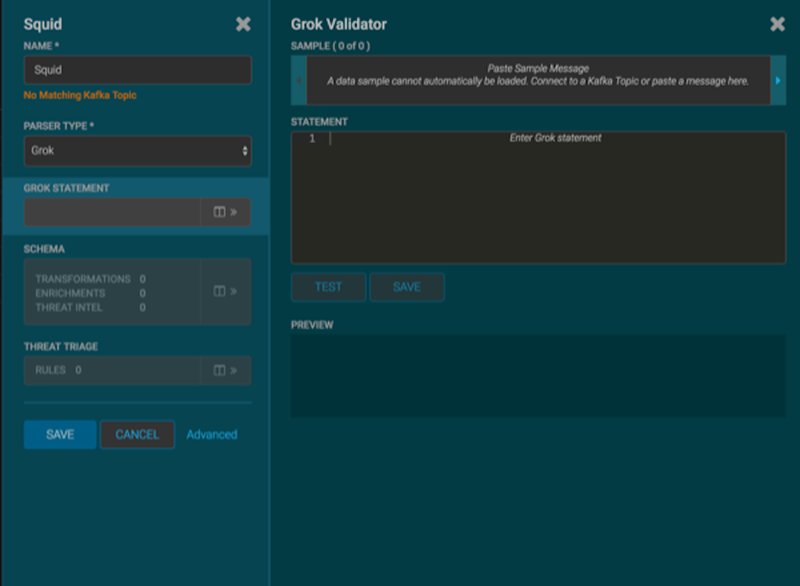 Continue to build and test the Grok statement until you have entries for each element in the log entry. This new data source processor topology ingests from the $Kafka topic and then parses the event with the HCP Grok framework using the Grok pattern. The result is a standard JSON Metron structure that then is added to the "enrichment" Kafka topic for further processing.